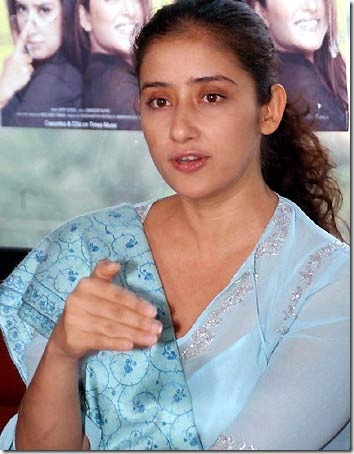 This blog post is about Manisha Koirala Biography,Pictures,wallpapers & Videos. Manisha was born in the Nepali Koirala family on August 16, 1970. Her dad, B.P. Koirala, was Nepal's Prime Minister before her birth, while two of her paternal grandfather's brothers, Girja Prasad Koirala, and M.P. Koirala were also Nepali Prime Ministers during the 1990s. Manisha grew up with her paternal grandmother in Varanasi, India. She studied in Vasant Kanya Mahavidhyalay. Then she re-located to New Delhi and was enrolled in Army Public School. After completing her school, Manisha had planned to study medicine and become a doctor. Instead of becoming a doctor, fate led her to modeling, and then onto the tinsel screen in Nepal in a 1989 movie 'Pheri Betaula'. She then re-located to Bombay and debuted in a Bollywood movie titled 'First Love Letter' which was released in 1991. Manisha has won five awards for her performance in 'Bombay', 'Khamoshi: The Musical'(two awards), 'Company', and 'Escape from Taliban'. She has obtained a Diploma in Film Making from New York, U.S.A., and is a member of the Independent Film-Makers Society. She is also the goodwill ambassador on U.N.F.P.A.. She is actively involved in bettering the status of women, women's rights, prevention of violence against women, as well as in the active prevention human trafficking, especially Nepali women, who are abducted and sold as prostitutes. She is well versed in the Bharatnatyam and Manipuri dance forms. Manisha is engaged to Christpin Conroy, the Australian ambassador to Nepal.